The ViewSonic PJD7828HDL is an impressive value for $589. It delivers the best contrast and three-dimensionality of any of its sub-$700 competition. And color is superb right out of the box -- it ties with only one other projector for the closest color match to a reference image. It also sharply focused from edge to edge, offers a 16.4 ms input lag for gamers, and provides a 1.3x zoom for greater setup flexibility than most of its competition. If you need yet another reason to consider it, it is bright enough even with our video optimized settings for a 155" 16:9 image in a dark room with a 1.3 gain screen or a 100" image in a room with moderate ambient light. Low Lamp Mode. Eco mode reduces lumen output by about 28% from Normal mode. Video Optimized Lumens. For film and video, Movie mode with Brilliant Color turned off delivers a close color match to a reference projector as well as contrast and image depth that's a step above any of its sub-$700 competition. Measured brightness is 927 ANSI lumens--enough with a 1.0 gain screen for a 135" diagonal 16:9 image in a dark room or an 85" image in a room with moderate ambient light. With a 1.3 gain screen, the sizes jump to 155" in a dark room and 100" with ambient light. Video Performance. The PJD7828HDL is also well suited for larger images or brighter rooms. Standard, ViewMatch sRGB, and Movie modes all offer color for film and video straight out of the box that's well within the realm of realistic. Dynamic goes slightly beyond a realistic range with only some scenes. Most people would consider it acceptable for occasional daytime use in a family room, for example. Brightest shows a green bias and slight posterization. However both are less extreme than with most of the competition's brightest modes. All of the color modes can be improved by lowering the Brilliant Color setting, but at a noticeable cost in brightness. In Brightest mode, for example, lowering Brilliant Color enough to remove the posterization, gives a lower brightness than Dynamic mode. Zoom Lens Effect on Brightness. The 1.3x zoom lens curtails light by only 8% at the full telephoto setting. Unless you're trying to get the largest image size possible, that's not enough to matter when deciding where to place the projector. Brightness Uniformity. The brightness uniformity is 54%. This would be unacceptable on more expensive home theater projectors, but it is typical in this entry level group of eight home theater models under $700, six of which measure 60% or less. Input Lag. Gamers will appreciate the 16.4 ms input lag in every color preset mode with 3X Fast Input on. With the feature off, the lag is 33 ms.
On-board audio. The 10-watt mono speaker delivers good sound quality and high enough volume to fill a large family room. Most of the ports are on the back panel. However, the HDMI/MHL-2 port is in a hidden compartment on the left side as viewed from the back. The port is meant primarily for a wireless dongle, and the compartment includes a micro USB cable to power dongles that need it. If you want to use the port for a second external video source or for an MHL device, you have break off a punch-out piece of plastic so you can run a cable through the hole and over the top or side of the projector. Throw distance. The 1.3x zoom lens has a throw ratio of 1.15-1.5:1 which falls at the short end of a standard throw, making it easier to get a large image in a small room. For a 120" diagonal image, the throw distance ranges from 10 to 13.1 feet. If you wanted to sit at a distance of 1.25x the screen width, a comfortable position for many, that would mean the seats would be about 11 feet from the screen--or right in the sweet spot of the lens. This gives you the option to place the projector between the seats on a low table, thus avoiding the cost and hassle of a ceiling mount. The ViewSonic PJD7828HDL Projection Calculator will give you the throw distance range for the image size you want. Lens offset. The lens offset is designed for installation either inverted in a ceiling mount or placement on a flat surface, including a low table between the seats. With the projector sitting on a table, the entire image is above the centerline of the lens, with the bottom edge of the image about 5% of the image height above the centerline. Placing the projector on a high shelf behind the seats and projecting over the heads of the audience will usually require you to tilt it downward to hit the screen. This would require keystone adjustments to square it up. Keystone is best avoided, since the keystone adjustment since it compressed the image, reduces lumen output, and can add artifacts to fine patterns in an image. 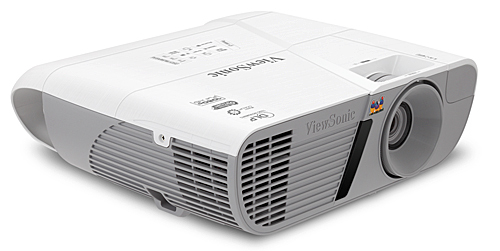 The ViewSonic PJD7828HDL is an impressive entry-level beast at $589 street. It can blast out close to 3000 ANSI lumens to give you a big image that can stand up to ambient light, the ViewMatch and Movie modes are accurage enough to give you a very watchable picture out of the box and bright enough for a 200" screen. Even with video dialed into its best configuration it is still bright enough for a 155" diagonal 1.3 gain screen in a dark room. The video optimized setting scores well for color accuracy, contrast, and three-dimensionality. It is easy to adjust color, and once adjusted, the PJD7828HDL delivers among the best matches to a reference projector available for a sub-$700 model. We saw some rainbow artifacts in contrasty black and white clips but almost none in color material. Movies in 3D are dimmer than typical compared to 2D, but with no crosstalk or other 3D-specific issues. Gamers will appreciate the input lag time, at just 16.4 ms with 3X Fast Input On. The 1.3x zoom is an unusual and welcome feature in this price class, giving extra flexibility for how far to position the PJD7828HDL from the screen. The lens also maintains sharp focus edge to edge and top to bottom on our sharpness test patterns. With the exception of the display of 3D which tends to be a bit dimmer than the competition, the ViewSonic PJD7828HDL is a strong competitor across the board with color accuracy suitable for traditional home theater, enough brightness to stand up to ambient light in a family room, and fast input lag for gaming. The combination makes it a top pick in this round up in four of our five categories: classic home theater, family-room TV substitute, room-to-room-to-backyard use, and gaming. 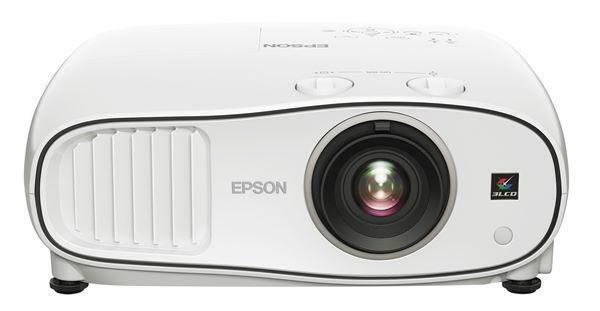 As good and bright as this projector is, I wish I had known about this before getting the Epson 2150 recently. As good and bright as this, I suppose the suggestion that 3LCD tends to be better than DLP in ambient light has some major exceptions.